Among the highlights of the Keynes Bequest are two volumes from Sir Isaac Newton’s library, with a fascinating history behind them. 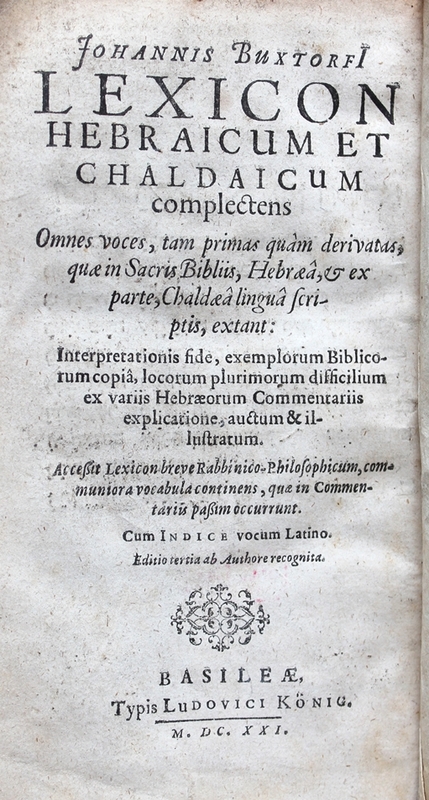 This copy of Johann Buxtorf’s third edition of Lexicon Hebraicum et Chaldaicum (Basel: Ludwig König, 1621) features an armorial bookplate with motto ‘Philosophemur’ and ‘Case G. F.4. Barnsley’ in ink underneath the bookplate. On the rear fly-leaf is the shelfmark ‘F2_27’. 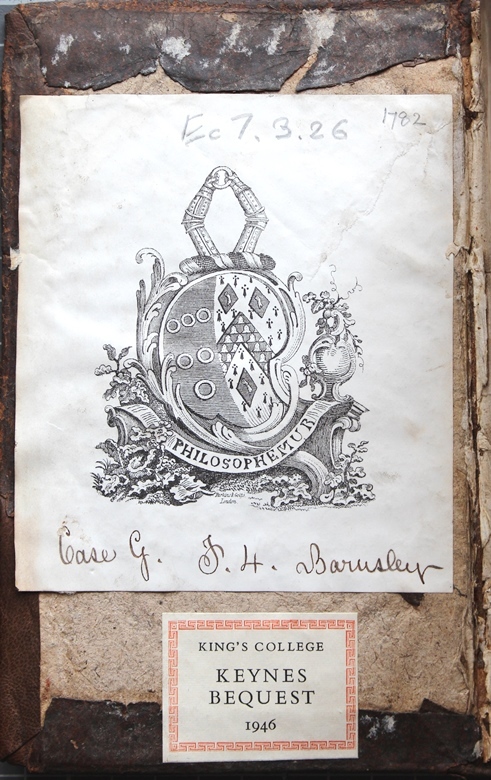 The ‘Philosophemur’ bookplate belonged to Dr James Musgrave, who was Rector of Chinnor, near Oxford. After he died in 1778 the library was removed to Barnsley Park, Gloucestershire, the home of his son, where the books were re-catalogued and re-classified with ‘Barnsley’ shelfmarks. Musgrave’s books had been previously owned by his predecessor at Chinnor, Charles Huggins, who received them from his father, John Huggins, Warden of the Fleet Prison. John Huggins had bought the collection from the estate of his late neighbour, Isaac Newton, for £300. Newton’s library was preserved almost intact until 1920, when more than half of the items were auctioned off and dispersed. Before securing one of the most important collections of Newton’s manuscripts in the world, which he acquired during and after a sale at Sotheby’s in 1936, John Maynard Keynes purchased two of Newton’s books from the Guildford bookseller Thomas Thorp in March 1921. 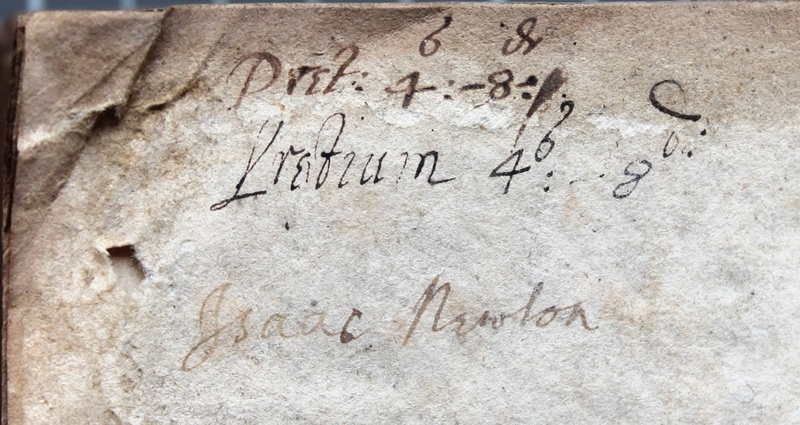 This Latin-Hebrew dictionary is signed on the front and rear fly-leaves: ‘Isaac Newton’, who also noted the price on the rear fly-leaf: ‘Pret: 4s: 8d’. 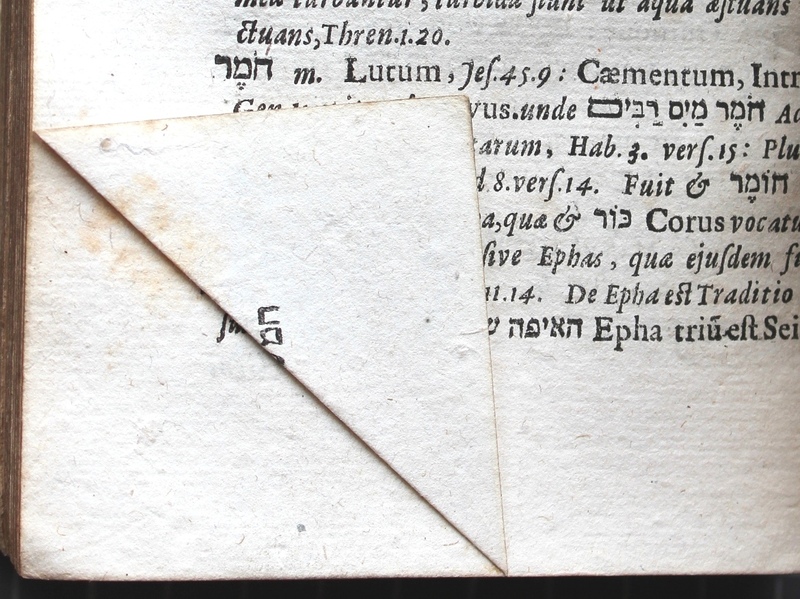 Newton had the habit of ‘dog-earing’ his books, turning back the corner of leaves to note a reference, the corner of the leaf pointing to the exact word he wished to highlight. Eight pages (pp. 11, 18, 29, 45, 164, 247, 593 and 636) are turned back in this way in this dictionary. For more information, see John Harrison, The Library of Isaac Newton (Cambridge: Cambridge University Press, 1978). Some of the information in this post is drawn from the SCOLAR blog of Cardiff University.